What’s new June 16, 2018. 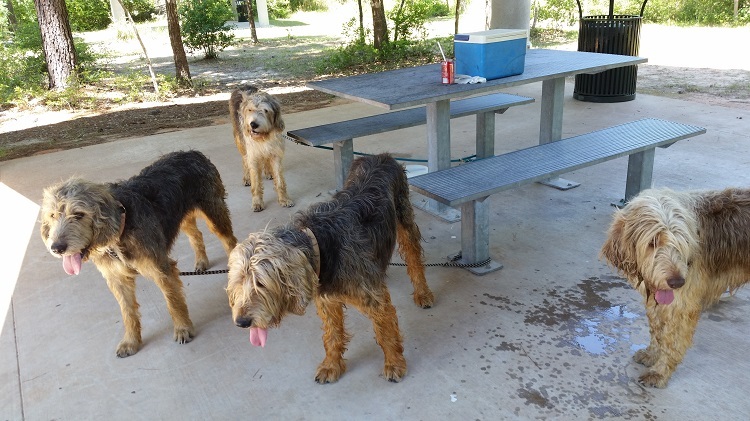 Time flies when you have a house full of Otterhounds. Three of the E litter have gone on to their new homes. Emilee Jade convinced us she needed to stay here. She is now seven months old and spends her time running with her older sisters. Well not always. Because of heavy rains in February, the base of the pond area fence was flooded. When the water receded Clara and the four D litter girls pushed out and took off chasing whatever they could find. We managed to get them back in about four hours and fixed the fence where they got out. The very next week the water had finally gone all the way down and they found another weak spot and got out again. We called and searched all day. We finally got them all back about nine hours after they got out. Needless to say,we did some major repairs to the fence. The D litter girls were scheduled to go have their hips x rayed once the E litter girls had left for their new homes. Just as we were ready to set up the appointment Dora and Dawn came in heat and we had to wait until a couple of weeks after their cycles. We were finally able to Set up an appointment to get their hips done on May 10th. We take the dogs to Houston to have their hips done because the vet there doesn’t sedate them. The girls weren’t thrilled with the van ride but they enjoyed the lunch break. They especially liked the pond at the rest area. Several weeks later we got the results back from OFA. It was great news. Dallas and Dora’s hips were rated Excellent and Diana and Dawn’s hips were rated Good. Now begins the search for studs for the girls. If all goes as planned we will breed one of the girls around the first of the year.